Milan’s gaze fixed on the dusty ground beneath him as a woman placed a piece of fruit by his side. While he appreciated her kindness, he was ashamed. Although he never dreamed of a luxurious life, he also never thought he would end up on the streets, begging for his next meal. 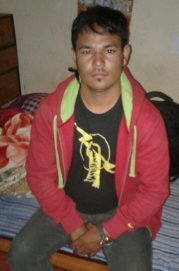 That was the very reason he left Nepal for India—to search for work and to escape the cycle of poverty that entrapped his family. Milan’s parents were poor and unable to provide nutritious food, basic necessities, or an education. From a young age, he determined he would be different. He would find a good job. He would provide for his family. That proved easier said than done. Milan travelled to India and searched in vain for a well-paying job. An illiterate boy with no work experience could only find employment doing hard, manual labor. He worked day in and day out—each moment draining the storehouse of hope he built in his heart, bit by bit, until one day, it was gone. He had no hope. So, he wasted the little money he had on trying to numb the pain, and when it ran out he sat down alone on a dirt path. Tears streamed down his face as he resolved that this was his life—a life of poverty. A life without hope. A life just like his parents. He had tried to escape, but it was no use. Milan was no longer destined for a life of poverty. Defeated, Milan returned home to Nepal. Shortly after arriving, he met a TTI church planter named Bina. As Bina shared the Gospel with him, something stirred in his heart.Hope. Each time they met, this hope grew stronger and stronger, until Milan could no longer refuse the source. He surrendered his life to Jesus, and wept tears of joy as hope and love flooded his heart. Jesus was the one he was searching for—the storehouse who never runs dry. Milan was no longer destined for a life of poverty. He was destined for a life of hope. A life of purpose. A life of making disciples.